Members of 1st Canadian Ranger Patrol Group, deployed with the Arctic Response Company Group, prepare their qamutiiks before departing for a patrol in Resolute, Nunavut during Operation NUNALIVUT on March 8, 2018. Photo: Petty Officer Second Class Belinda Groves, Task Force Imagery Technician. ©2018 DND/MDN Canada. Resolute Bay, Nunavut — Military operations and exercises in any environment have an inherent element of danger, but when the most northern areas of Canada are the staging grounds, the risks are compounded by polar weather and a vast and bleak terrain. 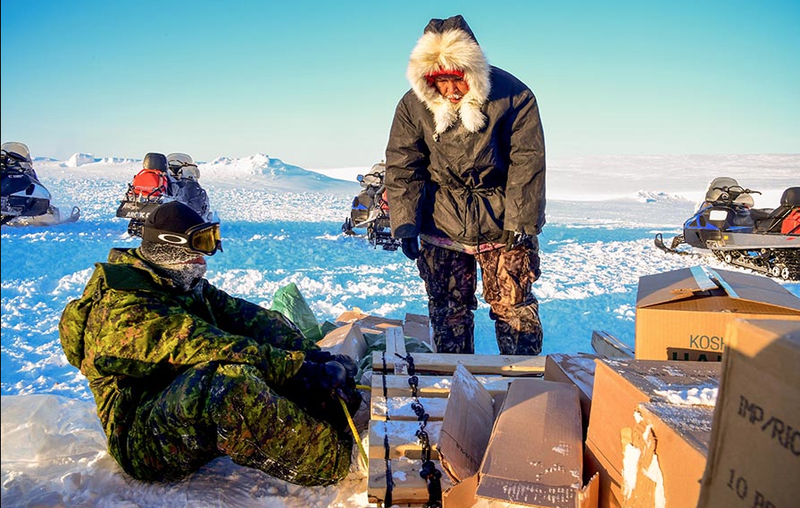 Fortunately for the Canadian Armed Forces (CAF), the Canadian Rangers are part of the team that trains Arctic Operations Advisors in Yellowknife, Northwest Territories and Resolute Bay, Nunavut each season. The 2018 course concluded in late March. The Canadian Rangers belong to the Army Reserve (ARes), and they live and work in remote and Northern regions of the country. They provide lightly-equipped, self-sufficient mobile forces to support national security and public safety operations within Canada. As emphasized in the Strengthening the Army Reserve (StAR) directive, the Arctic Operations Advisor (AOA) course trains Reserve and Regular force members together as much as possible to ensure they can be combined into one team when the need arises. The graduates who are ARes members will serve in their Divisions’ Arctic Response Company Groups, which are ARes-only organizations, while the Regular Force members will use their knowledge within their units. True partners with the CAF in the North, the Canadian Rangers carry out over 110 exercises and operations a year, including local sovereignty and training patrols, support to Canadian Armed Forces operations and exercises, and support to federal and territorial partners or other stakeholders. Captain Wayne LeBlanc works closely with the Canadian Rangers to deliver a broad range of Northern knowledge and skills. He has been the course commander of the AOA course for the past three and a half years. “We have one Ranger supporting in the Low Arctic Phase but we employ the bulk of the Rangers’ knowledge in the High Arctic,” noted Capt LeBlanc. The 45-day AOA course, which sees candidates split their time between Yellowknife and Resolute Bay, provides Canadian Army personnel with the tools they need to advise their commanders on how to more safely conduct military operations and exercises in Canada’s North, an environment that can be deadly if not understood and treated with respect. “I think this year's candidates in particular have been one of the best crops we've had. Originally from Nova Scotia, Capt LeBlanc has been a Regular Force Army member for 10 years. Now posted to the Canadian Army Advanced Warfare Centre, which is part of the Canadian Army Doctrine and Training Centre in Trenton, Ontario, he alternates between Resolute Bay in the winter and Trenton during the warmer months, when he runs the Mountain Operations Platoon. “I spend my summers teaching mountain knowledge,” he said. As for Arctic knowledge, he discussed some of the biggest challenges for those new to the North, solutions that he learned, in part, from the Rangers. Bundling up is not always the answer to keeping toasty, according to Capt LeBlanc. Ihuma is an Inuktitut word that has many meanings, but the most basic definition is reason, wisdom and knowledge, according to training materials used for the AOA course. A person with Ihuma is considered to have adult competence, and has what is needed not only for personal survival, but to have the ability to lead others in the harsh North. Known as isuma in some dialects, the concepts are important to Inuit across the Canadian Arctic. Someone who has ihuma is calm, cheerful and patient, particularly in the face of difficulty and frustration, has a realistic and flexible approach to the environment and a strong respect for others’ independence. Capt Leblanc described how, during the final phase of the course, participants must take advantage of the Rangers’ knowledge. “So what we teach is that when we are acting as advisors, before we go to our commander and give advice, we should first go to the Rangers and ask them what they would do. You know the saying, ‘you can lead a horse to water but you can't make him drink?’ Well, it's like that, but I think we're getting better at it,” he said. For the past two years, a new aspect of the training, called the Sub-Arctic Survival phase, has been delivered. Candidates spend three or four days out on the land without food or rifles. They may only use snares to catch small game and a ferro (short for ferrocerium) rod and metal striker to start fires. It emits a high-temperature spark when struck with a metal striker and is effective under cold, wet or windy conditions that would defeat matches or lighters. “We have a priority of survival, and that is shelter, water, fire and food. Food is very low on the priority scale because of the ‘Rule of Threes,’ which is in the order of what’s going to kill you fastest,” he explained. An aspect of ihuma that becomes important is keeping a positive attitude in the face of difficulty.